The Home Office has published the latest firearms licensing figures for England and Wales. The statistics show that while the vast majority of applications were approved, refusals are at or near their highest levels for some time, with the proportion of refusals and revocations being notably higher in Durham than in other regions. For the year to 31 March 2014, Durham firearms licensing department refused six per cent of applications for new firearms certificates (FACs) (eight out of 129). Out of all the other licensing areas, only two — Avon and Somerset, and Gloucestershire — refused more than four per cent. The average (mean) across England and Wales was 1.5 per cent. The proportion of FAC revocations in the Durham area was more than double that of most others and four times the average. With shotgun certificates (SGCs), Durham refused 16 per cent of new applications — more than three times the proportion of refusals in the next-highest areas, and almost six times higher than the average for England and Wales (2.8 per cent). As with FACs, the proportion of certificates revoked was also highest in Durham, being more than three times the average across all regions. Across England and Wales as a whole, around 1.5 per cent of new applications for FACs were refused, the second-highest proportion since 1999. On the shotgun side, though 97 per cent of applications for new certificates were granted, refusal rates were at a record high, with around 2.8 per cent of applications being turned down — the highest proportion since figures were first compiled in 1983. The proportions of renewals refused for SGCs and FACs also showed a slight rise compared with the year ending 31 March 2013. Overall, the figures demonstrate an increase in the number of both FACs and SGCs. FAC numbers are up 2.5 per cent from 147,695 to 151,413 — an increase of 28.6 per cent since 2002. As at 31 March 2014, there were 507,867 firearms held under those certificates, the highest number since figures were first collected in 1995. This figure represents an increase of 72 per cent since 1998, when the number of firearms held dipped to 295,000 following the Dunblane shootings. 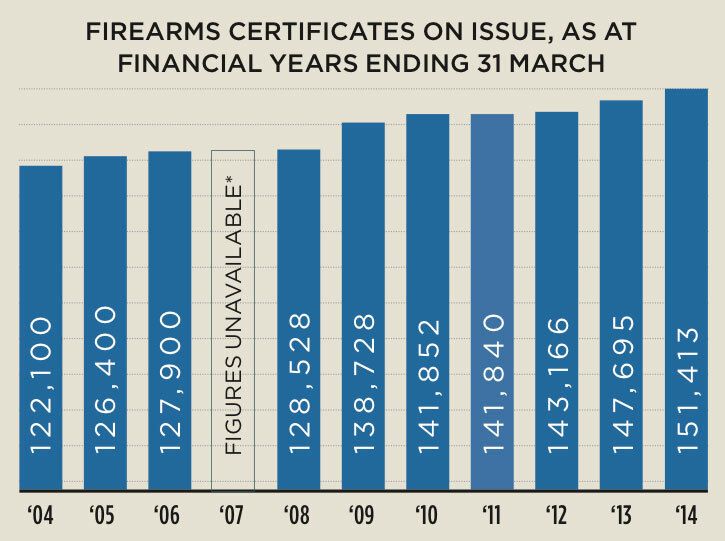 The average number of firearms held per certificate is 3.4, unchanged since the 2013 statistics. There was a 2.1 per cent rise in numbers of SGCs — from 570,726 to 582,923 — broadly in line with numbers since 2002, but a third lower than the 1988 peak of 882,000. There was a very slight drop (0.3 per cent) in the number of shotguns held under those certificates — from 1,333,701 to 1,329,376. 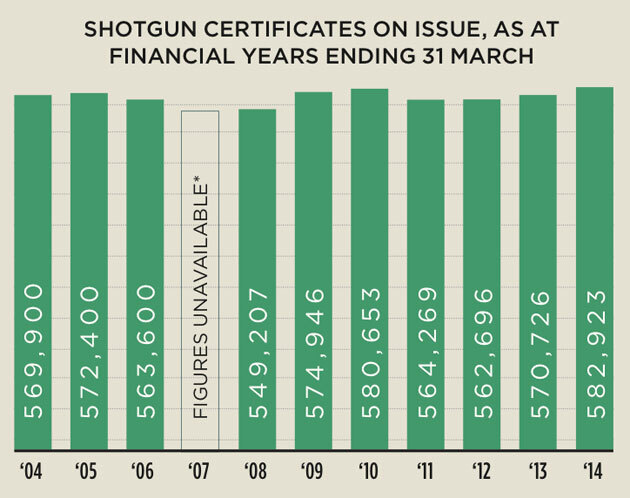 The average number of shotguns held per certificate has remained relatively stable since 1995 and is currently at 2.3. The regions with the highest number of FACs in issue were Devon and Cornwall, Sussex and Thames Valley, and the lowest were City of London, Merseyside and Cleveland. City of London, Metropolitan Police Service and Merseyside had the lowest number of legally held firearms per 100,000 population. The areas with the most SGCs in issue were Devon and Cornwall, Thames Valley and West Mercia, and the lowest were City of London, Cleveland and Merseyside. The number of shotguns covered by certificates per 100,000 people was highest in rural areas, with Dyfed-Powys, Norfolk and Suffolk coming top. The lowest numbers of shotguns were recorded for Merseyside, the Metropolitan Police Service and the West Midlands.